I saw these paw prints that had been preserved in the pavement and they reminded me of the images that I have seen of fossilized dinosaur footprints. Who knows, maybe these will tell archaeologists and anthropologists of the future something about the pets that Seoulites used to keep in this century. 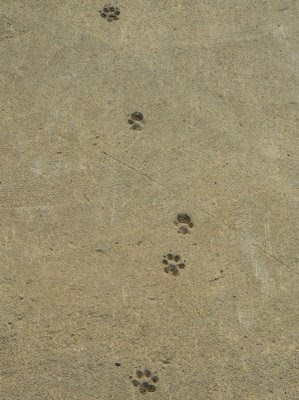 I come from Cyprus.. We have so many cats :)I see little "fossilized" paw prints everywhere! Its so cute. "I am just going outside and may be some time"